It's the first week of Finding Alice, and the rehearsal room, research, prop sourcing and venue visits are all underway, with the Lowry performance feeling closer and closer! Today, we are very excited to announce, that as a part of the Finding Alice process, we want to operate a completely open process, and share the ins and outs of theatre production with all of you. Producer, Hannah, has made the below video to explain what this is all about, how it will work, and how YOU can be involved. Please join in our #LiveUpskilling community, let us know what you want to learn about, and we look forward to embarking on this journey with you! It was a chance finding that started it. Browsing through social media, I noticed a call for short scripts to be submitted for a new initiative to Manchester. If accepted, the scripts would be performed as rehearsed readings. It was early in the summer of 2015, and I had a small collection of short monologues, courtesy of a project marking the twentieth anniversary of the Manchester Irish Writers Group to which I belong. I had always written short stories or poetry, and the group’s “Changing Skies” production had been a new departure for most of us: monologues charting 200 years of Irish immigration to the city. I loved the challenge of writing for the stage, but after the performances in March 2015, during the Manchester Irish Festival, was unsure how to develop my new-found enthusiasm. Then I saw that call for scripts. Professional directors? Professional actors? An emphasis on feedback for writers? How much would that cost? Several readings confirmed the almost incredible answer: nothing! The email from Diana, Hannah and Lisa came as a very pleasant shock: the script I had submitted, the story of Maggie, widow of an Irish patriot who joined the British Army during World War One, only to find he returned reviled, and mortally wounded, had been accepted, and would be performed at the inaugural “Scripts Aloud” performance at The King’s Arms. 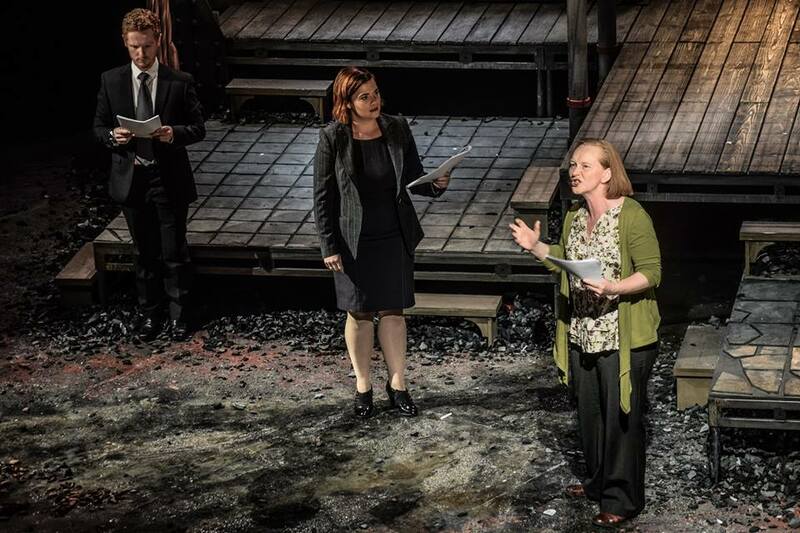 That experience, of seeing the superb Clare Cameron, under the inspired direction of Dan Jarvis, bring Maggie to life in “Songs He Left Unsung”, was the best “professional” development I could have wished for. And seeing the play performed as the first “Scripts Aloud” piece ever in Manchester, remains one of the proudest moments of my writing career. The last two years have provided several such experiences, opportunities to work with an unbelievable selection of directors in Craig Sanders, Samantha O’Rourke and Dan Jarvis (again), as well as amazing actors like Clare, Simon Naylor, Joel Parry, Ewan Orton, Billy Brayshaw, Ben Sherlock and Diana Atkins herself, who combines fabulous talent as an actor with “Duracell-bunny” energy, alongside Hannah Ellis and the growing team, in driving Manchester ADP forward. 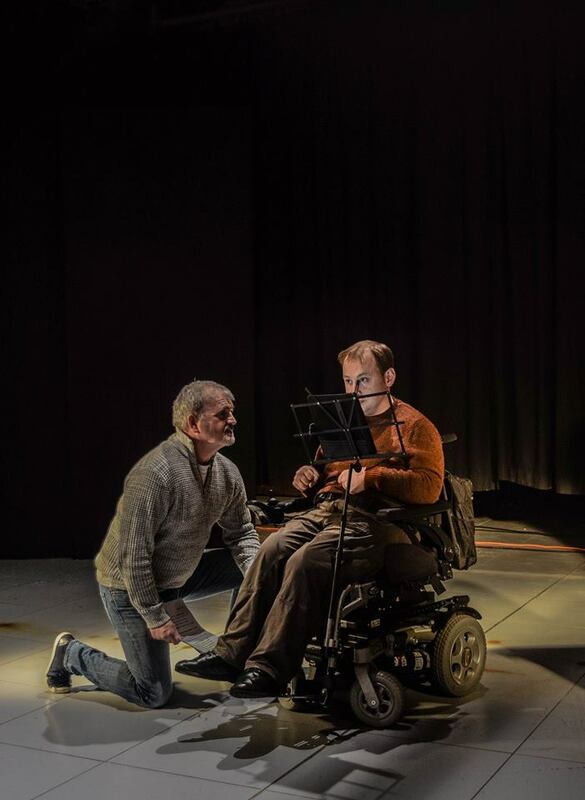 A particular high point – among many – for me, was the chance to write for performance at the Oldham Coliseum on 22 May – a night which tragically entered the city’s consciousness for awful reasons. Once again, ADP teamed my writing with an incredibly talented group, with Joyce Branagh directing “Never Wonder” and a dream cast of Jill Myers, James Oates and – once again – Clare Cameron. ​The King’s Arms remains the spiritual home of ADP, but one remembers great evenings at The Lowry, 53two and Oldham Coliseum, and particularly the creation of a community of mutual support and constructive criticism, culminating in the success of Alex Keelan and Tim Keogh in the recent Manchester Festival, winning respectively Best Comedy Play (“The Loves of Others”) and Best Newcomer (“Thorn”) with pieces that were developed after performances originally brought to “Scripts Aloud” evenings. I’m sure every member of that community was as delighted as I was to see their success; proof, if any more were needed, of the value and benefit of the ADP. ​Long may it continue to thrive! Thank you so much Kevin for this post. It warmed our hearts. Long live ADP! When Manchester ADP invited me to be part of 'What the Dickens', 4 modern responses to Oldham Coliseums main production of Charles Dicken’s Hard Times, I was thrilled and slightly nervous. Writing a modern response for such a classic was a daunting task but I was interested to see what happened. ADP sent over a copy of the directors script for Hard Times, it was fascinating to read the play and also all the directors notes too. It wasn’t too difficult for me to think of a scenario initially, Dickens' novel focussed on the treatment of the working poor, industrialisation and privilege, shining a light on suppression of imagination and choice for working people. Dickens also sort to expose that money is often, falsely, used as an indicator of worth, value, and morality. The current political climate gave me an easy parallel. I chose to pin the story on the welfare state, setting the play in the local Job Centre. The relationship that stood out most in the main stage play was the father daughter relationship of Mr Gradgrind and his daughter Louisa. Mr Gradgrind, the local teacher, was steadfast in his belief that children should not use their imaginations and should only ever rely on facts, without question. Louisa followed her fathers inflexible instruction and grew up to live in an unhappy marriage with local mill owner and bully, Bounderby. At the end of Hard Times, Gradgrind realises his strict instruction and control of Louisa ultimately led to her misery and unhappiness. Unlike another character Sissy, Gradgrind adopts her from a local circus but is unable to force out her imagination and free will. I decided to mirror this relationship in my short play Harder Times. My first draft didn’t quiet capture what I wanted to say, I really wanted to focus on privilege and how it can impact on our capacity to empathise with people from different backgrounds to ourselves. I also wanted to look at how our current welfare system removes choice from people looking for work and doesn’t allow for creativity or imagination. Many people, regardless of qualifications and experience get offered zero hours, minimum wage jobs in call centres. I thought it would be interesting for Louisa to have fallen on hard times and need to access the job centre her own father, Jobsworth, oversees. In my response, Louisa enters the job centre with an air of superiority, she isn’t like ‘these’ people. In the waiting room she comes across Sissy and Stephen and we can tell she believes they are the undeserving poor, not like her, a good middle class women that’s only fallen on hard times because her architect company made her redundant (following her pregnancy). I met with the Director of my piece, Rose Van Leyenhorst to discuss my play. Rose liked my idea and premise and we had a great discussion about class, privilege, creativity, and lack of control. Rose told me that she usually directs futuristic pieces and suggested I might have a hint of something more sinister in my play. I loved this idea, and went off to write my final draft. We talked about people possibly being killed if they were of no more value in these call centres, we talked of the parallels at the moment with sanctions and fit for work assessments and the devastating impact these decisions can have on people’s lives. I decided to use the character of Sissy to suggest this possible threat, in my play she tries, in vain, to warn Louisa and Stephen about the 'Calibration Portal' (we never find out what this really is but it is suggested that it is a place they send claimants after they have been sanctioned, a place they cannot return from). Louisa’s interactions with Della, the robotic, cold, job centre worker, finally make her realise that Sissy was right and they were not that different after all. Louisa argues with Della and much to her surprise her father is working at that centre that day and comes over to see what has happened. Unlike in Hard Times, Louisa is able to tell her father what she thinks about their privilege and his rigid views and he realises that now his daughter is in this position he may have played it wrong. I used a couple of lines from David Cameron’s speech on welfare in 2012 at Bluewater, ‘compassion isn’t given out in welfare cheques’. At the rehearsals the actor playing ‘Jobsworth’, Shaun Hennessy, said this was his favourite line. 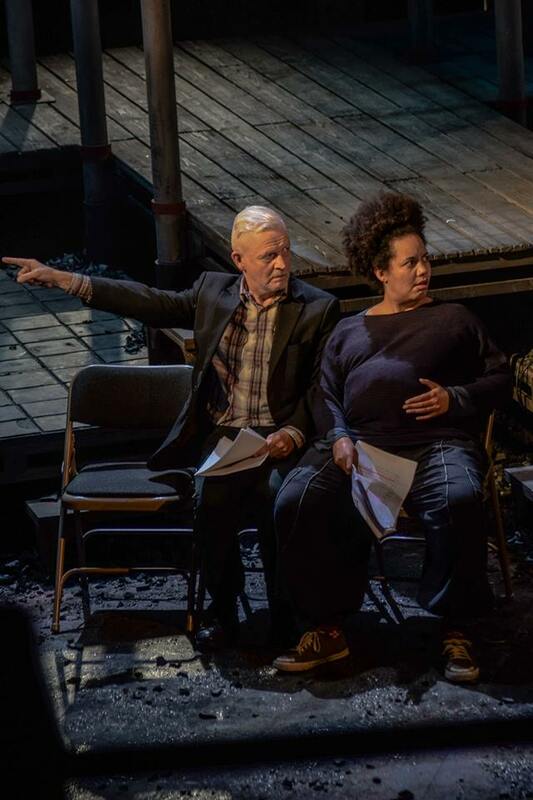 It was such a joy to meet the actors at rehearsals on the Sunday, they were so talented, Morag Mclean Peacock, Emily Heyworth, Helen Katamba, Adrian Palmer and Shaun Hennessy did such a great job bringing the play to life. Rose really developed the futuristic theme with great subtlety and we had a great response on the night. Seeing my play performed on such a great stage, using the Hard Times set, was a real treat and a night I’ll always remember. It was great seeing how the other writers had interpreted the play, each one was completely different. What the Dickens was a credit to Manchester ADP and to Oldham Coliseum, I’m so glad I was able to part of it. Manchester ADP, Scripts Aloud is such a great resource for new writers, seeing and hearing my work performed has really developed my skills introduced me to so many talented actors, directors and producers and helped my career. I had a full length play reading there in January for The Loves of Others, as a result it is part of this years Greater Manchester fringe festival, playing at 53Two 18-22 July. If you have a script you are working on I urge you to send it in to Manchester ADP, you won’t regret it. 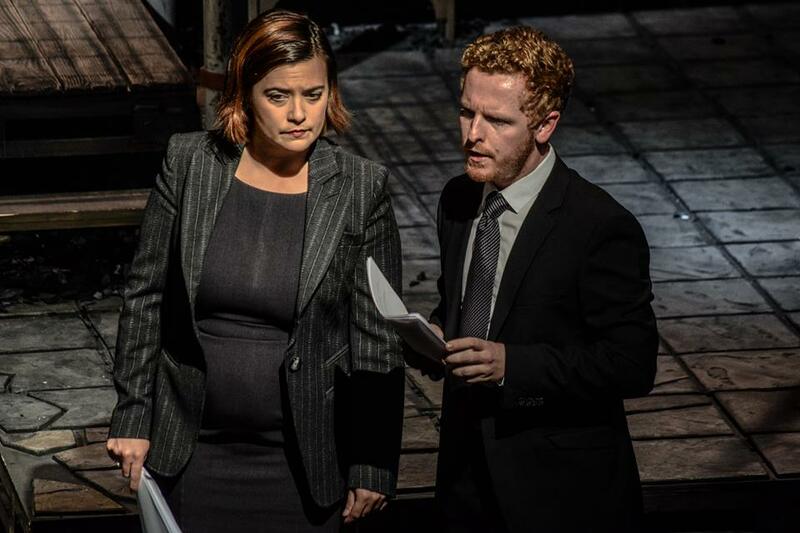 I was recently fortunate enough to be cast in two consecutive ADP rehearsed readings. The first was at 53Two in Manchester city centre and the second was at the well-known Kings Arms Salford. But I had a guilty secret. I thoroughly enjoyed both productions, not only from the point of view of the actual performances, but the whole buzz that surrounds putting on a production with scant rehearsal and the need to make bold choices in a short space of time. The whole process of getting a production from the page to the stage is gratifying for an actor at several points along the way. Firstly there’s the thrill of being cast at all; knowing that someone has seen something that they like in you and is willing to put even a small part of their production in your hands. Then there’s the fun of getting to know your character. Playing with voices and choices before turning up to that all-important first rehearsal, followed by that, sometimes awkward, moment of meeting the director and the rest of the cast. Looking your fellow players in the eye and hoping that you’ll get along. 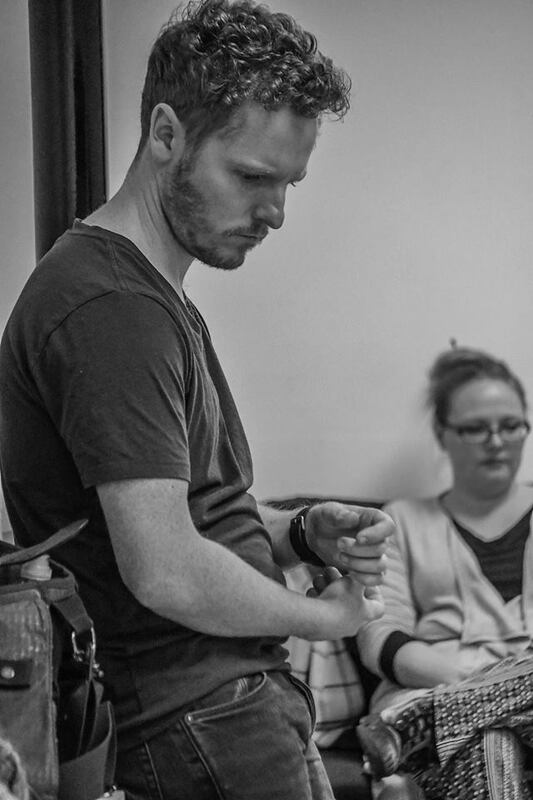 Rehearsals give the chance to get to know everyone and to mould the disparate characters into a performance worthy of what the writer had in mind at the time of writing; time for the director to bring together the various ingredients and to turn them into a dish worth tasting. In a traditional environment this process takes place over weeks or sometimes months, but that’s not the ADP way. 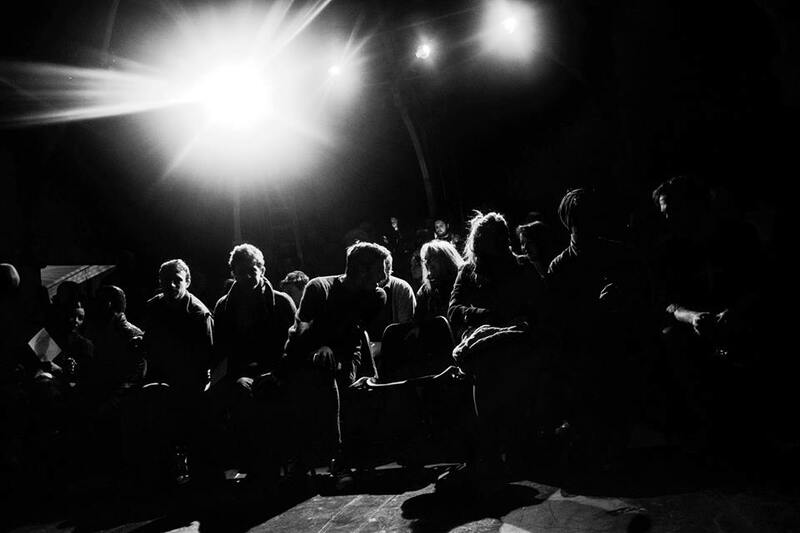 Manchester ADP distils the essence of the theatrical journey and serves it up to the actor in a concentrated form. If the normal process is a skinny latte, the ADP experience is a double espresso with a spoonful of caffeine thrown in for good measure! The full nine yards compressed into a twenty-four hour inch. So, having gone through the first performance without a hitch, I confessed the truth to my fellow players and our director, the delightful Kayleigh Ruth Hawkins. I hadn’t wanted to tell them before the performance, lest it put the fear of God into them, worried that I’d fall to bits with fright as the curtain went up. The truth of the matter was that my last appearance live on stage was playing Judas in an abortive production of Jesus Christ Superstar some 41 years ago! Yes, I acted between the ages of 5 and 18 and yes, I’ve spent the last couple of years re-kindling my love for the craft by acting in a host of local screen roles. But there’s no substitute for that instant feedback when performing in front of a live audience. There’s nobody to shout “cut!” You’re out there with all eyes on you and the rest of the cast depending on you to play your part. It may have been 41 years since I was last on stage, but it felt like it was yesterday. Thanks to Kayleigh and to Rose Van Leyenhorst for casting me and thanks to Manchester ADP for making it all possible. It won’t be 41 years until the next one! As ever, when one is asked to re-visit, remember in detail and commit to Realms of Bloggery the circumstances of a truly memorable occasion it`s almost impossible not to give way to the temptation of re-inventing the narrative in the re-telling. However, most of what follows is unequivocally the truth. The rest should be. My introduction to ADP was through the `Help Wanted` column of December 2015`s issue of `Desperate Actresses and Directors`, a copy of which I came across on Pension Day at the local Post Office. I remember thinking that both `trades` should combine, form a partnership and launch an independent Theatre Company, but that`s a story to be told by someone else. The advertisement, almost a begging letter if I recall correctly, stated simply that the services of Photographer were required: quite how desperately required soon became apparent. I replied to the ad, stating that whilst I couldn`t claim to be an actual photographer I did at least own a camera. I was hired on the spot. It was an arbitrary, fortuitous decision that came at a pivotal moment in a tale of Four Thirds. The First Third, 1951 - 1983, covered three fabulously formative decades culminating in a rather hazy period of Love, Peace and Brown Rice that will forever essentially be `The Who that I Am`. The Second Third, !983 - 2015, saw my outward transition to Husband, Father and Corporate Monkey eventually managing 8 figure Project Budgets whilst still seeing Jimi Hendrix floating above the head of anyone wearing Pink - and an awful lot of my C M Colleagues favoured Pink Shirts and Ties. For over thirty years Batman`s struggle to keep his secret identity intact paled into insignificance when compared to my Boardroom Subterfuge. I was Ghandi with a loaded P & L and still believed that `All You Need is Love`. As soon as I no longer needed to Work to Live, I baled. Made a funeral pyre of my suits, shirts and ties to the strains of Siegfried`s Funeral March from Gotterdamerung and ran for the hills. The Third Third, 2015 to ??? saw me leaving the hills and washing up on the shores of ADP, camera in hand, and completely out of my depth. To be able to say that I`ve been a part of the ADP Story from Chapter One is a source of great personal pride. I`ve witnessed the fabulous personal and collaborative creative endeavour that has fuelled the growth and continued successes of Our Community and, twee as it may sound, have also grown personally in so many ways: The Old Dog/New Tricks myth has, in my case, been well and truly debunked almost entirely due to the support of the ADP community. To date I have had a script performed and have another awaiting a performance date; both enabled the completion of a full script that has already had expressions of interest from two independent production companies. I`m still not a `Real Photographer` but have an ongoing project working with low light, theatrical photography and as I apparently have a `Job for Life` with ADP have no worries on that score. In short, I can now masquerade as `Not a Photographer who is also Not a Writer`; how deliciously bizarre my life has become; sincerest thanks to you all for helping me along that particular path.